Sometimes jaw-dropping natural scenery is the best backdrop for stunning wedding photos. 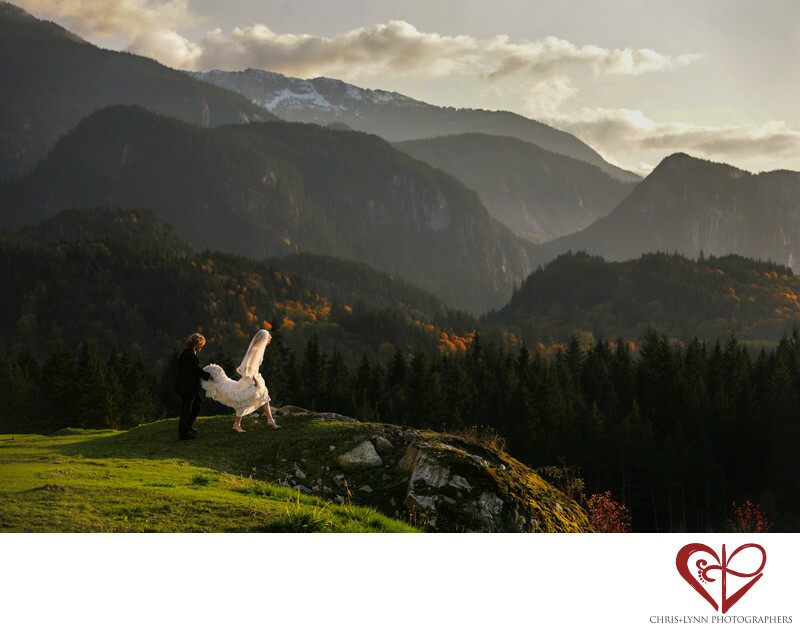 This mountaintop backdrop in beautiful British Columbia at sunset is a dramatic and rustic setting for this image of the bride and groom, and completely different from any photo they might have from a typical urban city photo shoot. Choosing an outdoor location for your wedding ceremony, reception, or bride and groom photo session does require some planning. In cold areas like British Columbia, having a weather plan in case of rain or even snow is crucial. For mountain and outdoor weddings in tropical locations like Mexico, this is not as important, but still a good idea just in case! When we do a mountain photo session, we always recommend bringing a different pair of shoes to get to the location, sunglasses, a sweater, and maybe some bug spray. Depending on the location of your wedding, we have recommendations for lots of unique mountain locations - some easy to get to and others requiring some hiking or even transportation by helicopter. This image is one of our favorite mountain wedding photos because of the unique location and dramatic light. The layers of the Coast Mountains unfolding in the distance really give you the sense of being in the true wilderness. I love the way the sunlight is is illuminating the bride's veil and how the groom helping her with the train of her dress as they walk to the edge of the boulders. 1/500; f/4.0; ISO 400; 90.0 mm.